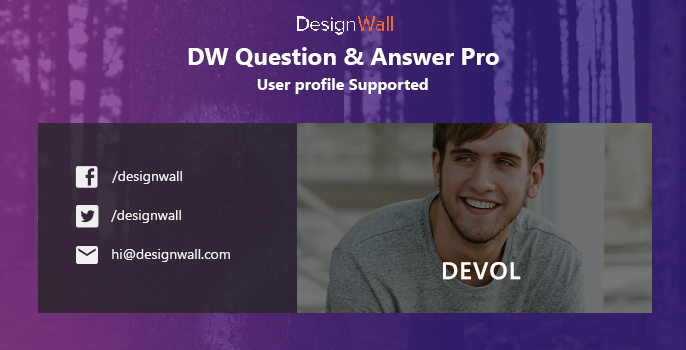 To admit it, it’s been a while we have not made any major updates to the plugin DW Q&A, nonetheless, we always provide active support for bug fixes on our Question & Answers page. But that’s for 2017, for the upcoming time we plan to upgrade and enhance our DW Q&A plugin with a bunch of great features enabling DW Q&A plugin to be more flexible. In many months for the plan and discuss, we have updated the profile page for the DW Q&A in this version. This is a beta version for the profile page. We have supported to show the question and answer filter tabs and the user can update/change the cover image and avatar. It’s like Facebook 🙂 But different. You can get profile page with some very simple configure. Just inserted the [dwqa-user-profile] shortcode to the page then select this profile page in the Question settings. We greatly appreciate contributions from you and the community. In this update, we greatly appreciate contribution from Marcus Scheunemann for German language (de_DE) file. Huge thanks to you, Marcus Scheunemann 🙂 Up to now, DW Question & Answer has been translated into 20 different languages over the world. If you wish to help us add more languages, you can submit your translation files via Github. Just take a look at the guideline here and submit your language files to Github. In the version 1.1.8, when a user logged access a profile of another user will view the answers of the user logged not the answers of the user that you are viewing. However, We have fixed this issue in the V1.1.9. Thanks to supporting queries from our users, we detected minor bugs related to URL, Language, notification and so on. We have fixed these bugs and have them released in this latest version of the plugin. Restrict/Membership content: Integrate with Woocommerce / Easy Digital Downloads Plugins or Once click PayPal button. This helps you create paid support package. There are cases where site owners want to maintain paid technical support service and users need to buy access to premium support etc., This feature will be possible with (upcoming) payment integration. What do you expect to see in the upcoming versions of the DW Question & Answer plugin? Let us know your thoughts and ideas in the comment below.